C-DOT CTX Series of Routers are carrier-class IP/MPLS routers capable of providing secure packet data transfer over IP/MPLS backbone and access networks for providing NGN/IMS Services. The CTX 1000 Router is based on modular OS and distributed architecture supporting high availability feature (greater than 99.99%) with built-in fault tolerance and redundancy to avoid single point of failure. The interface modules are packaged as Rear Transition Modules (RTM), to provide various kind of interfaces from the rear side of the chassis. However, it is also possible to provide additional interfaces and value added functions through Advanced Mezzanine Card (AMC), which can be plugged in from the front side of chassis on an ATCA line/switch carrier card. 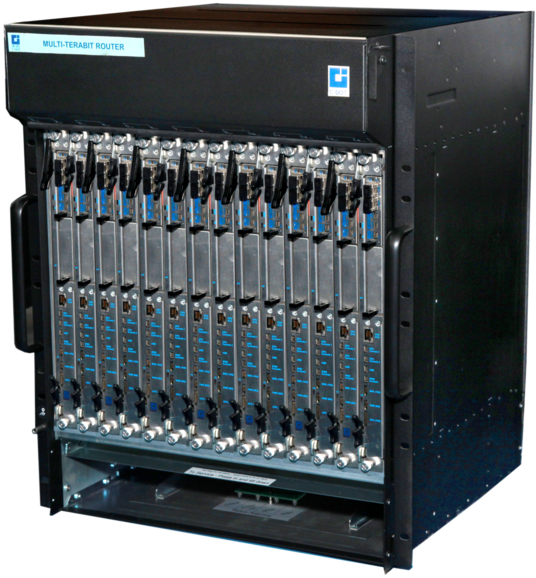 These routers have a switching fabric and backplane capacity of up to 960 Gbps in dual-star fabric backplane chassis. In full-mesh fabric backplane chassis, this capacity can go up to 6 Tbps. The product family provides a scalable solution for carrying voice, data and video traﬃc generated in the network. These routers can be used as core routers for the backbone connectivity or as gateways and can be deployed as a Customer Edge or Provider Edge. To meet future requirements, upgrades can be carried out as and when required, without aﬀecting the services. The system design ensures that all the cards are capable of non-disruptive hot-swap for insertion and removal. The CTX-1000 Router Software known as C-DOT Router OS (CROS) is a reliable, high-performance carrier class network operating system used in routing, switching, and security products developed by C-DOT. It exploits the capabilities of the underlying hardware platform, so that the Router can process data packets at the line rate.